Sometimes I feel as if I’m caught between two voices writing this blog. My primary goal is to show that life with Down syndrome can be as “normal” as any that of any family’s. Yes, Mini is approaching the big 0-4 and not so much of an inkling of a tinkling in the toilet in sight. The words are slow to come too. There has been a dramatic increase in the amount of temper tantrums, which are to do with a lot of frustration on her part. Frustration that she cannot communicate as effectively as she would like, frustration that her little hands lack the strength and coordination to dress herself properly, frustration that some of the kids in playgroup don’t understand her need for personal or “Mini” space. All of these things threaten to cause the mercury in my internal thermometer of pessimism to rise. Living with Down syndrome is a steep learning curve and I’m discovering more and more every day. I don’t always like what I find. Then there comes a day like last Wednesday where I feel calm and reassured about life with the extra chromosome. On that day, we went to a friends house for a play date. The adults chatted over coffee while the little ones ran, jumped and played. Mini is enamoured with Fae (not her real name), the four year old daughter of a good friend of ours. Fae in turn loves Mini. We were instructed to come even though at the time Mini-Mini was at the epicentre of a chicken pox outbreak. A playdate with Mini was more important than the possibility of contracting pox you see. After a while, cake made a welcome appearance-gateau au citron. We all sat around, little ones included, and ate our cake. Then the girls got up and resumed their play. Fae was directing most of the action as she is the verbal one in the relationship but Mini was more than happy to follow suit. Six o’clock came and we said our goodbyes. I helped Mini to put on her coat, scarf, and hat and we held hands on the short walk back to the car. 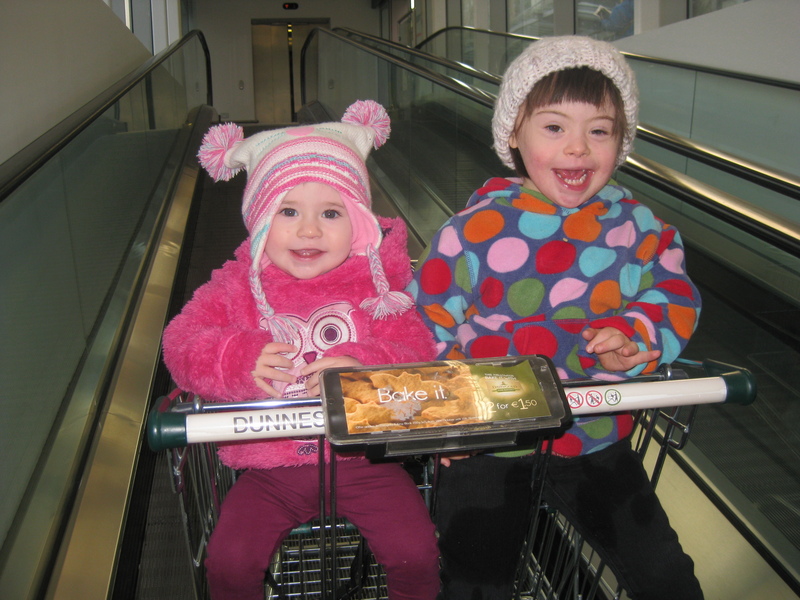 We stopped off at the local supermarket on the way home,and as I put the two girls into the trolley, I chatted to Mini about the afternoon, asking her if she had had a nice time. As is always the case, I was met with mostly silence, punctuated by some Mini speak. I’m looking forward to the day we can have an actual conversation but I’m also perfectly happy with days like these, as “normal” as you like when I feel incredibly lucky to have my two little ladies and I look forward to life with them, just as they are. Just lovely! We all have those unsure days, worrying about our kids and their own unique personalities, but then we have the days you mention and everything is good and we get to remember how wonderful the normal simple pleasures of life are. Thanks for the reminder, needed it today. Thank you!Im remindin myself of it after today which was full of tears and not so great!